How can I water proof my distributor? We often have customers wanting to use there V8 off road and this often means that they will encounter water. Why shouldn't you use a "Rubber Glove"
The reason any petrol engine with a distributor struggles when in water is due to the hot exhaust manifold creating steam when it goes into water. This steam then gets inside of the distributor (both electronic and points) and this is what temporarily stops your ignition system from working. Also it is a good idea to spray a lacquer (such as damp start) over the leads and, more importantly the spark plug and distributor cap ends. This will act as a repellant against the water. Take the hard plastic vacuum pipe and select a drill bit which is slightly smaller in diameter. Now drill two holes in the side of the distributor cap (one opposite the other as in the pictures above) being sure to not interfere with the rotor arm or posts inside. Now take two small lengths of the plastic vacuum pipe and push these into each hole (you may need to make the holes slightly larger however this must be a tight fit). 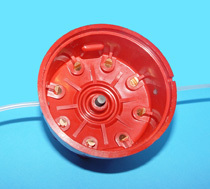 Mix a small amount of epoxy glue and place some on the outside of the distributor cap around each pipe. Also please note that you may have an original breather hole in your cap which will now need blanking which can be done with epoxy glue. Now refit the distributor cap, you can if you wish use some silicon sealant to help seal the cap to the distributor body. 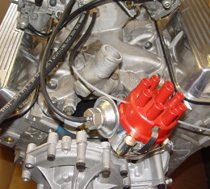 Once fitted run one length of rubber pipe from one side of the distributor cap to a constant vacuum port on the engine. Then run a length of rubber vacuum hose from the other side of the distributor cap to the inside of the vehicle. This modification means that there is a constant flow of fresh (dry) air through the distributor cap. Lastly we would recommend using some damp start over the ignition leads (in particular the boots) or failing that some spray oil as this will act as a good repellant to any water.